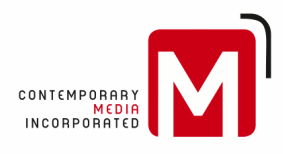 Contact Us - Contemporary Media, Inc. Contemporary Media, Inc. offices are located in downtown Memphis atop the historic South Bluffs of the Mississippi River. Our office hours are Monday-Friday, 8:30am-5pm. We observe most major holidays.